Four virtual stereo cables and a dedicated effect rack! Wouldn't it be cool if you could have instant access to all audio signals playing on your PC? 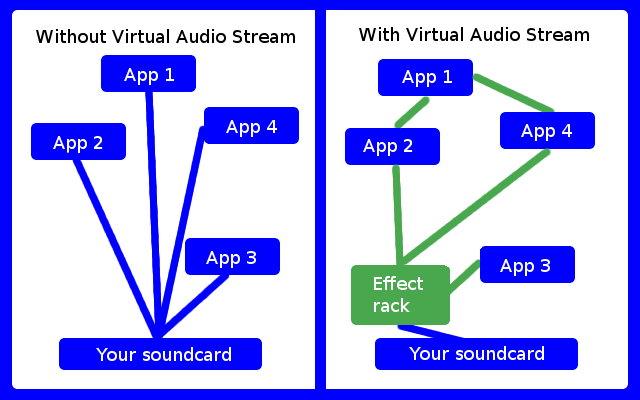 If you could stream audio from one application to another or even run all your audio through a dedicated virtual effect rack in pristine quality? DDMF's virtual audio stream lets you do just that. Four virtual stereo audio cables plus an effect rack that gives you access to the almost unlimited universe of VST effect plugins... try the free demo (occasional noise bursts added) and give it a ride! Usually, all programs send their audio output to your soundcard independently. With Virtual Audio Stream you can route the output signal of any application to be the input signal of any other application. Furthermore, using the effect rack, you can route all audio through a set of audio effects. A VST effect rack which can treat sound from up to four sound cards independently! Instant access to the myriads of VST effects, many of them free! What you get are actually two products in one: a 4x2 channel, CD-quality virtual audio driver that takes care of routing all your audio signals to and from any application, and an effect rack application that can wire up chains of VST effect plugins (the de-facto standard format for Windows audio effects) for up to four soundcards independently! The effect rack can be loaded with VST plugins, many of which are freely available at sites like KVRAudio . Optionally, you can purchase Virtual Audio Stream bundled with three top-class DDMF effects: IIEQPro (EQ), NYCompressor and NoLimits (Limiter). More info about these effects is available here. The virtual audio driver together with the effect rack is available for $29. Optionally, you can include DDMF's IIEQPro, NYCompressor and NoLimits (which normally sell for 3 x $39 = $117) for only $70 more, which makes it a total of $99. Virtual Audio Stream is a product of DDMF, a renowned manufacturer of audio software. Orders are processed through Fastspring.com, a US-based reseller trusted by millions of customers all around the world. All usual payment options are accepted, including, of course, Paypal and credit cards.